Fraud is the result of government and insurance company control of health care. The growth of bureaucracy is a precursor to incompetence and soaring costs of medical care. A lack of clinical diagnosis and a dependence on expensive testing has increased costs while decreasing the doctor's competence. 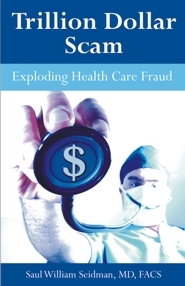 The FBI and the attorneys general of all states are dealing with exploding health care fraud. The result is a trillion dollars in waste and deception. Trillion Dollar Scam details the origin of this fraud and waste, and offers solutions to fixing the broken U.S. health care system. S. W. Seidman, MD FACS, is a retired neurosurgeon with more than 25 years of experience in practice and teaching. After completing his neurosurgery residency at Yale, he worked at Kaiser Redwood City. He enjoyed a private neurosurgical practice for 25 years. He taught at University of California- San Francisco, is a lifetime member of the American Association of Neurological Surgeons and a lifetime member of the American College of Surgeons.